This 2017 spring season, we explore the urban side of California in Downtown Los Angeles with our new line of cruisers and longboards. This season, we globally launch the Dusters California Locos line of cruisers featuring artwork by Chaz Bojórquez, John Van Hamersveld, Dave Tourjé, Gary Wong and Norton Wisdom. Other boards include the Channel Prism drop-through and the Lite Honeycomb drop-through longboards. Whether you're into carving, cruising or commuting, we've got a board to fit your riding style! Over the years, one of the greatest expressions of artistic individuality and identity in skateboarding has been through the design of the board itself. 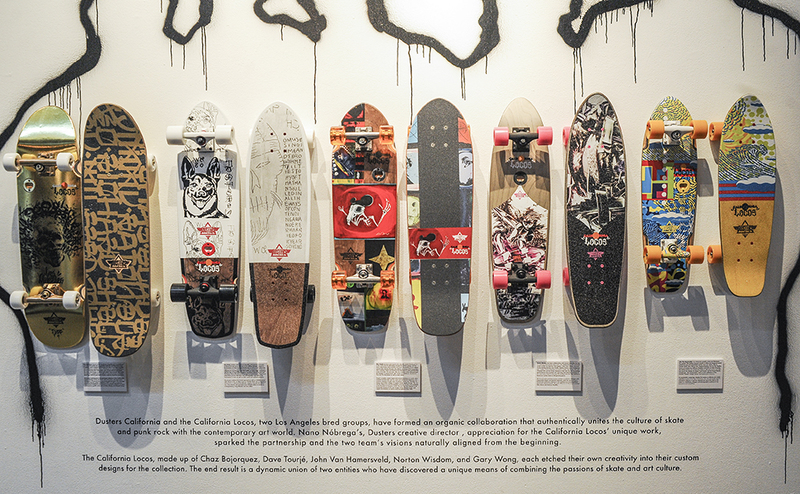 Dusters California and Brazilian visual artist, Cusco Rebel collaborated to create a board that not only functions as a skateboard but also as a piece of art in and of itself. Using public space as his canvas for colorful, creative expression, Cusco’s work often reflects his background in graffiti and environmental expression. The project began a year ago when Dusters commissioned Cusco to install a painting at their skate ramp. Cusco’s work was then photographed and used for the graphic of the Rebel cruiser, a new addition to the Dusters line that features classic Red Star-Trac Kryptonics, 80’s style rails, and a “Dusters Art Mount”, a routered hole in the nose of the board to functionally display the board as an art piece on any wall. Dusters also used Cusco’s artwork to the design the Gofish, a fiberglass longboard with camber construction. This collaboration was made possible with the participation of, EAT, a creative studio that delivers your brand story through design, technology, and experiential art. Both the Rebel and Gofish are now available worldwide for the holiday season. This is one of the original artist series from Dusters and they plan on developing many more in the coming seasons. Stay tuned for some amazing global artists joining forces with Dusters California. As skateboarders, we thrive to discover and experience new spots to ride and hills to bomb. Every season we pack the van up with all of our new boards and camera equipment in search of hidden gems to ride. This time we were itching to get something off of our bucket list. It’s something you can only do in very few parts of the world... Surf, skate, and snowboard all within the 24 hour anomaly that we like to call a day. Everyone talks about it but we asked ourselves, who has really done it? The crew who set voyage to conquer this marathon consisted of Dusters riders Tom Ryen, Justin Burbage and Malachi Greene, Cinematographer Brent Black and Dusters Creative Director Nano Nobrega. Tom is best known for his appearance skating and snowboarding in the Fuel Tv show "The Adventures of Danny & the Dingo." Justin was born and raised on the east shore of Oahu surfing and skating all day every day and Malachi is a downhill machine out of Santa Cruz, CA. Wether you were directing, filming or riding, everyone in the van was down for completing the full triad. Starting off the day at 7am, we headed to Breakwall, Venice Beach for a quick dip. The ocean was flooded with Los Angeleans from Burbank to PV, the conditions were glassy, but it was still a fun time nonetheless. After surfing was checked off the list, we moved east to skate one of San Bernardino’s most attractive skateparks, Fergusson Park. This is where the boys shined and the park had lots to offer for testing out the new Grind Frames and the Cusco Cruiser. From there, we headed up the mountain towards our final destination, stopping briefly for Malachi to get a taste of the gravel on our brand new Keen Downhill board. Once we made it to Big Bear Lake, the sun was long gone, but we still had time to get in a night session in at Snow Summit, ending the day with some icy carves and fun park features. As always, the discoveries were exciting, the laughs with friends were memorable, and the fun we had testing out new boards was epic. "All we roll is surf, skate and snow... The California dream is real!" Virginia Beach, VA - Dusters California headed to the east coast to showcase their new and exciting line of skateboards in collaboration with the CALIFORNIA LOCOS- five pioneering Los Angeles artists whose roots are steeped in graffiti, skate, surf, punk rock and the contemporary art world. Dusters crew headed to the bay city of San Francisco, CA to test out our new 2016 summer line of cruisers and longboards. Featuring the Dusters Voyage, Grind and the Urso, this season we introduce a variety of new shapes and designs for all riding styles. Dusters California Locos art show, skateboard launch and film premieres at the Venice Beach Rose Room on June 25th. 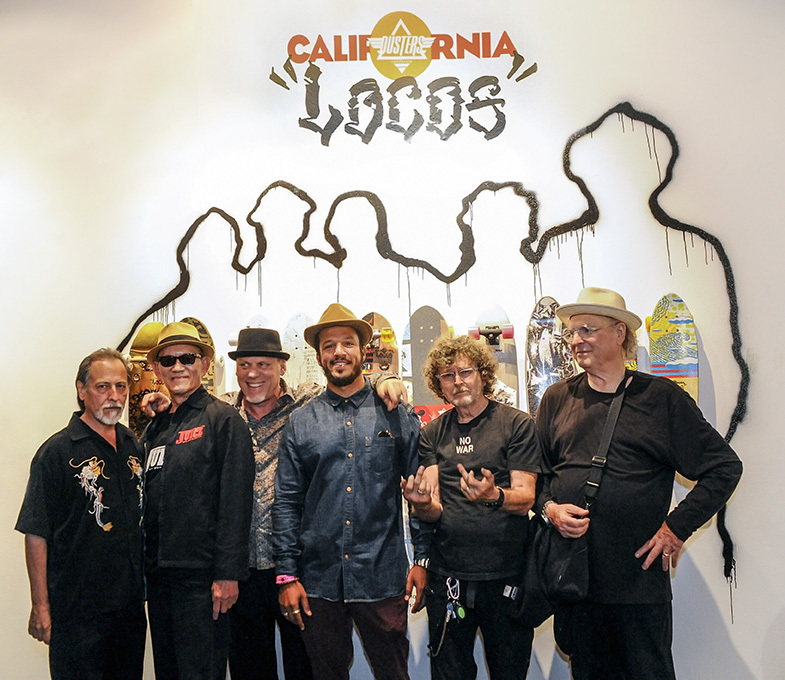 Chaz Bojórquez, Dave Tourjé, John Van Hamersveld, Norton Wisdom and Gary Wong showcased new artwork while Dusters California launched their new Locos skateboard collaboration. This summer, Dusters California collaborates with one of the most compelling groups of visual artists working in Los Angeles today, the California Locos. Chaz Bojórquez, Dave Tourjé, John Van Hamersveld, Norton Wisdom and Gary Wong are rooted in graffiti, surfing, skating, punk, rock, and contemporary art.